The first notable change in this new version was requested by our customer. He is merchant based in EU and current default date format is confusing him. So we added an option that can be changed in General settings pop up on the welcome page. 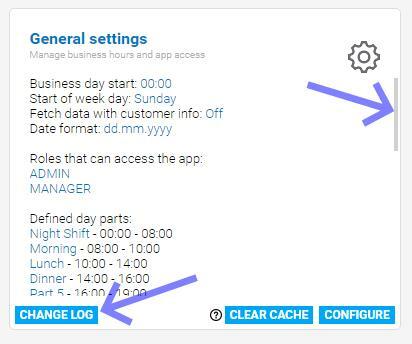 By default, the date format is set to be YYYY-MM-DD but now you can choose to have additional two formats that will apply throughout the whole application. 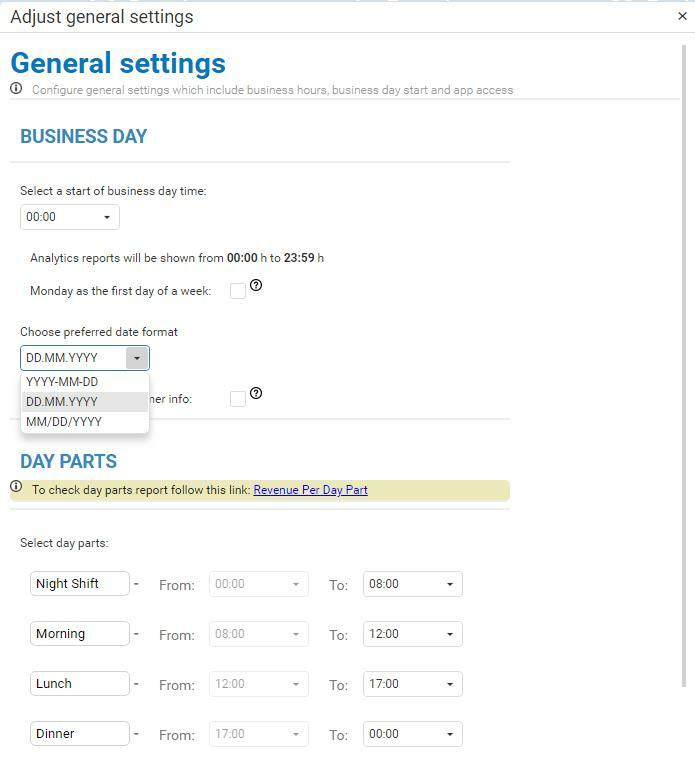 Selected and saved date format will affect calendar input fields as well as all Analytics reports/charts. We have improved Modifiers report. Without getting too much into details about processes that are happening ‘behind’ the scene while you are using this report we will just say that its speed was optimized. 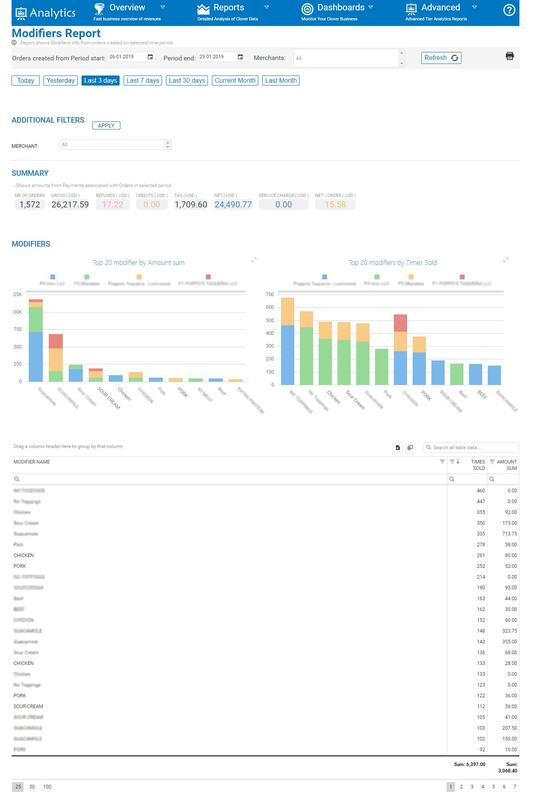 Especially after the data was initially cached, which allows ‘smoother’ change of reports as well as no need to select the period you wish to analyze which you were already analyzing on some other report. We also added additional filtering where a merchant can filter to show results for 1 or more locations that he has in his multilocation. And additional 6 charts for three tables on that report. First two charts that we added are for Modifiers table. That table shows you all modifiers that were used in the selected period of time with key information such are how many times that modifier was sold and what is overall Amount sum earned from it. In the following picture below you can see our demo test merchant that has 4 locations in a multilocation feature. Both charts will show you the TOP 20 modifiers by AMOUNT SUM (left chart) and TIMES SOLD (right chart). Mouse over the bar will show you additional information like which location it is, and depending on which chart are you looking at, how many times modifier was sold or overall modifier amount earned. Next two charts are showing visualization for MODIFIERS COMBINATION table, where you can see top 20 combinations from all locations, with left chart showing you their Amount SUM and the right chart showing you how many times a particular modifier combination was sold. 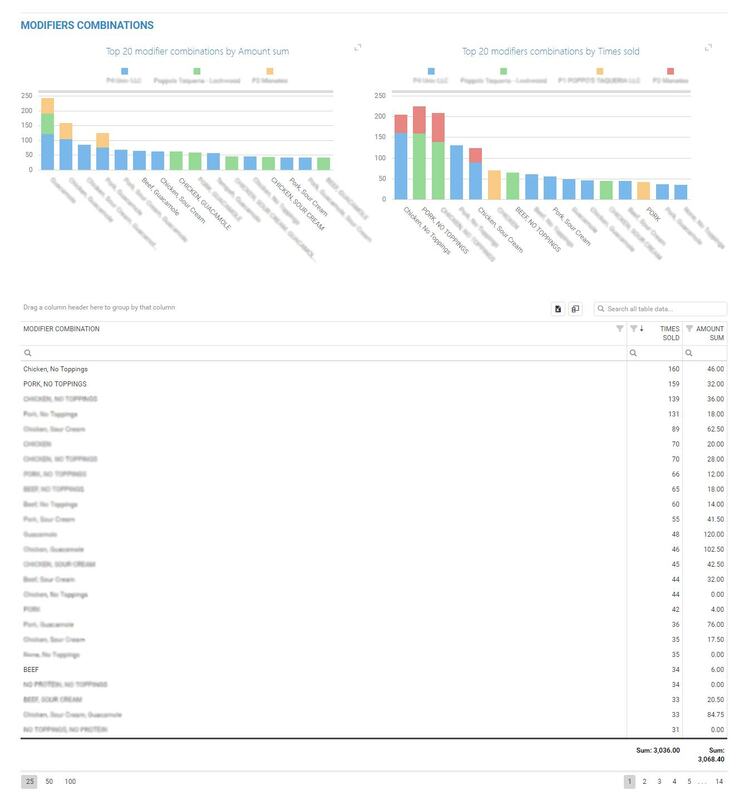 Just like every chart in Analytics you can mouse over a BAR in the chart to see which location and what modifier combination is in question. And last fifth and sixth charts are showing visualization for ITEMS- MODIFIERS HIERARCHY table. That table is grouped to show you ITEM and all of the modifiers that were ‘used’ on it in the period of time you are analyzing. So, the left chart will show you all modifiers amount sums that were used on a particular item(s) whilst right chart will show you all modifiers on items but with information of how many times that modifier was sold. We have improved General Settings ‘box’ on the welcome screen by adding a scroller on the right side. Scroller was necessary as we plan to add additional settings for users in the future, for example, users will be able to select Analytics App language. On the same ‘box’ we have added a new button called ‘Changelog‘ which opens a basic text file where we (developers) will write up brief changes that occurred in the current dated version. This way our merchants can spot possible features that were added which could be of use to them (If they wish to read more, they can always visit our web pages). 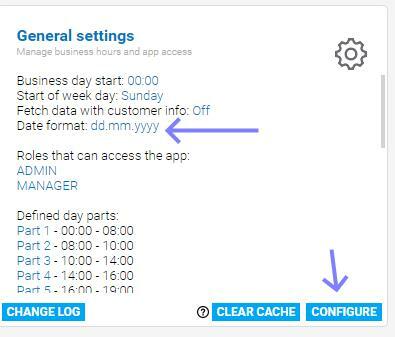 Also, we improved ‘CLEAR CACHE‘ button to clear local browser storage. A lot of times our merchants use reports and perform various searches/filters on the tables or resize/add/remove columns. All of these settings stay saved in local internet browser storage of our user. Merchants sometimes forget that they have filtered table and then this option will help restore things to their default values. Rather then us sending pictures to our users showing them how to clear local storage on 4-5 most popular web browsers. – we have added three new reports that can now be emailed to your address at a specific time. These three reports are by far most detailed reports from the current list. You can download an example of these reports above by clicking on them. For the whole list of available email reports please click here. 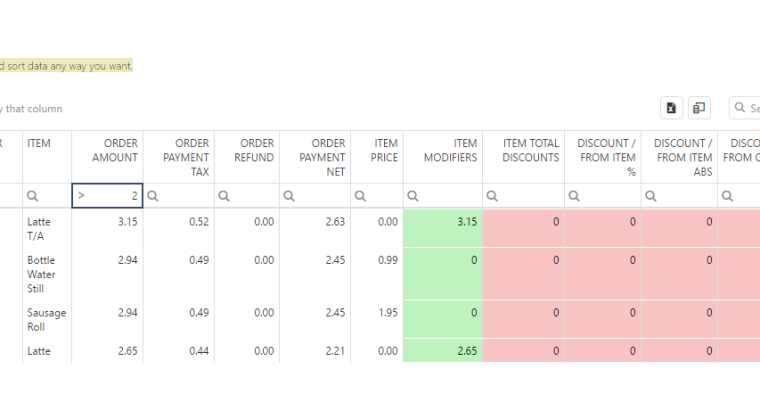 Added DateTime object column to Pivot Order/item reports. We have fixed Inventory Management item count. When merchants saved inventory settings (min/max quantities) but eventually deleted from Clover some of those saved items we would keep those items in our database which have resulted in the bigger stock count than it should of. That is fixed now. After every refresh, we will check if the items are deleted and remove them from the table. We have fixed Stock Value reports item count as well. The summary would show item count even for deleted items. That is fixed now. The summary will show you a number of items that are not deleted. In the table you would still able to see ‘deleted items’ but you can use ‘Deleted’ column from column chooser to show/filter only items that are not deleted. In general settings pop-up, merchants can now use a checkbox to select whether they wish to fetch orders with customer data. 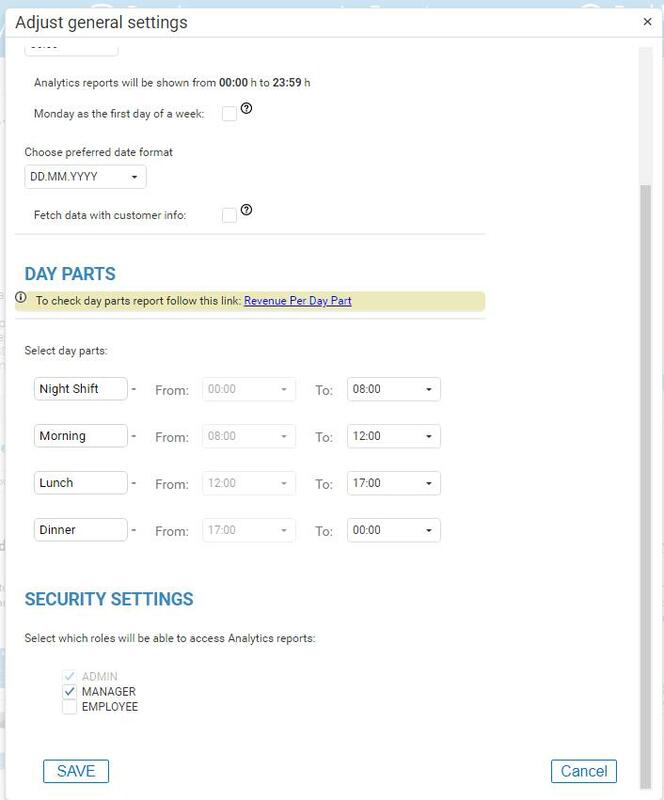 Fetch Customer Data – If checked and saved, you would be able to see customer name, email address and customer phone number if it exists on the following reports; full orders details report, orders with items details, pivot item/order level data reports and Revenue per Customer. 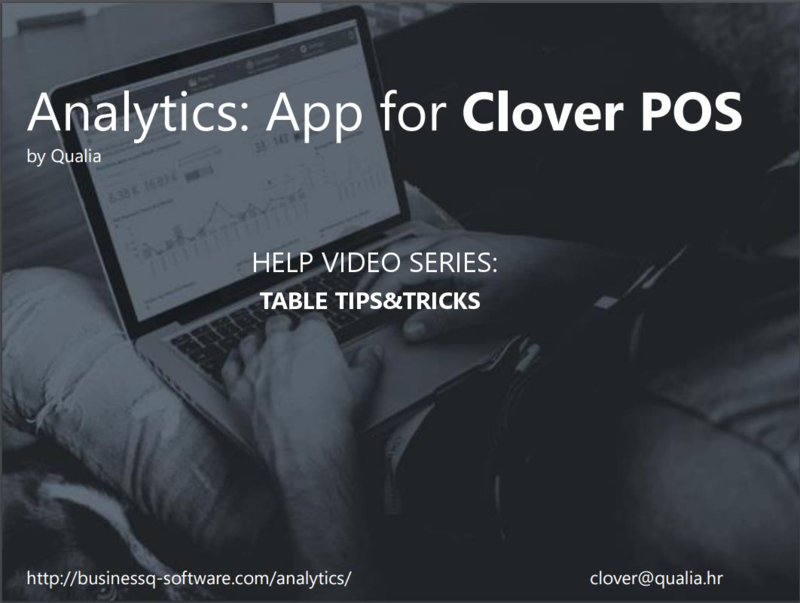 If you do not need customer information from orders, we suggest leaving it unchecked as it can, depending on the number of customers, greatly increase the time of initial caching of data from Clover. By default on report Revenue per Customer you would be able to see customer name, but Fetch customer data needs to be ON if you wish to see their telephone numbers or email addresses. -we will continue to optimize speed on the following reports: Orders with items details, Discounts report, Revenue per Day Part, Revenue Trends, Full orders details + all dashboards. In the near future Analytics app users can expect great performance boost, especially users with 20+ locations in our multilocation feature. We are in process of creating a new Analytics Tier that will be based on Data Science and Machine learning which will allow us predictions and revenue forecasts and different recommendations. Example, we would be able to predict the next 12 months of revenues with great precision, especially when data is seasonal which is very important for restaurants and hotels. Also, we would be able to recommend bundles from the menus for the cafes and restaurants. For Example, Bundle Americano and Big brownie every Friday after 5 pm and you will see a great spike in sales. Also, we will build specialized reports that will help managers to detect potential internal frauds like when some employees are constantly giving big discounts to the same group of people – it can be suspicious.